Arvala (and Klinger) says Hello! "Oh, Hi there! Sorry, I was reading an old book written by this Lovecraft guy of yours! He's absolutely fascinating! I never thought that such stories would be so similar to the Great Algoros! I could just read this for days..."
"... Hmm? Oh, right, sorry! Got a bit distracted again." "Anyways, my name's Arvala Malloske!... 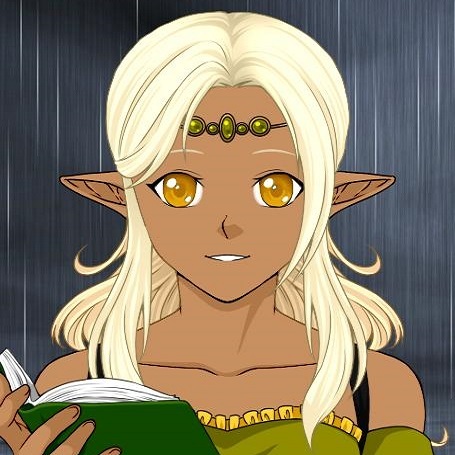 but you, umm... probably already knew that... heh... umm, let's see, a little bit about myself... Oh, I'm a High-Elf, more particularly a Sun Elf, (if you can't tell from my lovely bronze skin). I'm a Warlock, my otherworldly patron is Algoros the Omniscient, I like reading, practicing awesome magic, and anything with Honey on it... Hmm... what else?..." I've just recently started DMing myself, a little over a month ago, and so far my players seem to be enjoying themselves! I might be new to DMing, but I'm definitely not new to Roleplaying. I've been an on-again/off-again Forum Roleplayer for about 7 years now, and I've done one or two online MMORPGs before this, which I first started my RP tracks. I found this place when I was doing one of my more recent Google searches for DMing Resources, and just loved the ideas that I saw on here! I'm eager to explore and contribute to the vast resource on here as well! "Anyways, aside from that little OOC stuff, Arvala Malloske is here and ready to follow whatever path her Great Old One sends her on next, and maybe to give a few ideas along the way! "Oh, Hey there Klinger! Did you want to say hi to all the new people?" "Sorry, I forgot to mention, Klinger's my Octopus Familiar. I carry him with me inside my Staff, and I don't know what I'd do without him! He's helped me get through quite a few situations that I might have gotten hurt in. Try not to get him too upset though, he'll bite you, and, umm... it's a liiiiiittle poisonous. Don't worry though, just don't make my little Klingy jealous, and you'll be just fine!" "Anyways, it's great to introduce myself, and I can't wait to talk and collaborate with the rest of you in the future!" Re: Arvala (and Klinger) says Hello! Hi, Arvala, welcome to the Citadel! Hope you enjoy yourself here. "Thanks! Can't wait to explore and look around! From what I've seen, I'm liking the Roleplay section a lot, and I hope I might be able to grow both as a writer, and with my own ideas! Not sure which to check out first... it's like a shiny new toy I got with all these features I've yet to discover!" "Klinger's happy too! He's glad to finally see someone else besides just me. He gets a little lonely sometimes with just us. He's a really social octopus." I'm involved more heavily over at the submission end of the Citadel but the forums is a great place for chatting (besides the chat box) and roleplaying. Take your time exploring around but do visit some of the great submissions available here. He likes to wear Octopi as hats. I didn't know Klinger had a name. Never thought it could be tamed so we always had follow it around and clean up after it. Welcome to the Citadel Arvala.